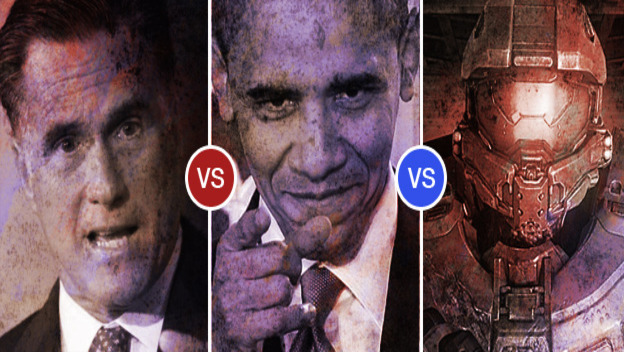 Did Microsoft’s Halo 4 Launch Affect the Presidential Election? With Halo 4 inching toward its midnight release on Monday night, several of my friends began to joke about their inevitable departure from reality. "If you don't hear from me within the next few weeks, it's because you're not as important as Halo 4. Please don't call to check on me." This was an actual Facebook status (which collected several likes and one frowny face in the comment feed). These people were probably being semi-hyperbolic, but with the presidential election and Halo 4 landing on the same day, I started to wonder if Microsoft's latest blockbuster could have a genuine effect on the election. So, being the hard-hitting, investigative journalist that I am, I jumped into my rusty Oldsmobile and stopped by a few local game dealers just before the midnight launch. Now, depending on your level of pessimism, what I'm about to say may depress you a bit, but I'm going to say it anyway. From my limited research, Halo 4's midnight release could very well have had an effect on voter turnout in the presidential election. However, it probably wouldn't have enough influence to actually sway the end result. In fact, it probably would have increased Obama's victory margin. Of the 215 eligible voters surveyed, only 52% of them planned to take a break from Halo 4 in order to hit the polls. This represents a statistically noticeable drop from the national average, which George Mason University's Michael McDonald estimates is somewhere around 60%. And even though an 8% drop is significant by itself, it's compounded by the fact that I live in Minnesota, which typically has the highest voter turnout rate of any state in the nation. 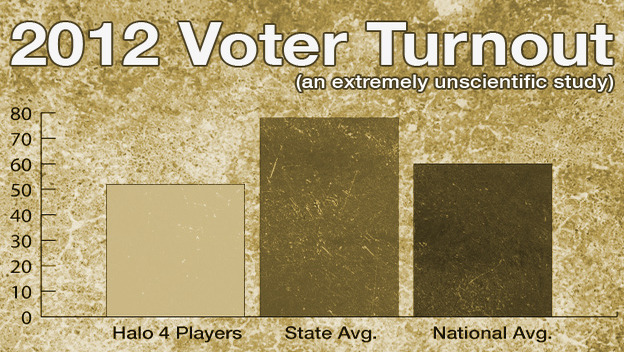 An estimated 78% of eligible Minnesotans cast their vote yesterday, which makes Halo players seem even less patriotic. If these numbers could accurately be extrapolated across the entire population, which of course they can't be, it could mean that hundreds of thousands of votes may have gone uncounted due to Halo 4 (and gamer laziness). In 2010 Halo: Reach sold more than the 3 million copies on launch day. If we assume that Halo 4 will improve on this number (Microsoft hasn't released their stats just yet), these sales could account for a pretty hefty chunk of missing voters. And considering how close this race has been, all of you non-voting Halo players should feel a little guilty. However, there are several pretty significant caveats that need to be mentioned: First, I was only able to swing by a few retailers and all of them were within a reasonable driving distance from my house. So, we're not exactly getting an accurate sample of the country's population. Also, in statistical measurement, there's a phenomenon called the "Leading Question Bias." This happens when people consistently respond to the question in a certain way because they think that they're giving the interviewer what he wants. I purposefully phrased the question so that no one would feel as though I was passing judgement on them if they choose not to vote. However, this could have easily skewed the results downward if they thought I wanted a negative answer. Lastly, even if everyone who purchased a copy of Halo 4 had voted, it probably wouldn't have affected the end result. Obama's winning margin was well outside of any influence that Halo 4 might have played. And considering how much of Obama's core demographic sits within the Halo demographic, any Halo-related votes would most likely have simply extended his lead. Either way, the question remains unanswered, and there's a significant amount of research that would need to be done in order to figure out how much weight the Halo 4 vote would have carried. But the fact that a poplar video game may have played a role, no matter how small, in a national election should probably force us to examine our priorities more closely. And we should all cross our fingers that Activision doesn't plan to release Black Ops 4 during the 2016 election. That could really screw things up.